Offering Gel FX nails and manicures in the comfort of your own home. The Gel system has been designed as a flexible alternative to nail extensions, and is less distressing for the natural nail plate. Gel FX offers glamorous nails for up to two weeks without chipping and peeling off. I have a range of colours and offer a mini manicure prior to prepping the nails ready to apply the Gels. This product as stated above last two weeks and requires soaking off when you feel the product is ready to be removed. I currently offer evening and weekend appointments. I am based in Eaton Bray and am happy to travel to surrounding areas. Eaton Bray Chiropody is based within the Trading Faces Hair and Beauty Salon in Wallace Drive. 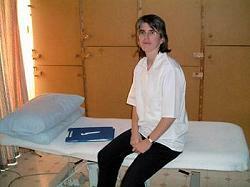 The chiropodist is Hilary Tomlinson (MSSCh MBChA), who is registered with the Health Professions Council. Hilary also treats patients at the existing Leighton Chiropody Practice in Lake Street, Leighton Buzzard, where she has provided locum cover for the last 10 years. Anne Johnson's practice serves the towns of Luton, Dunstable and Leighton Buzzard as well as the local communities of Eaton Bray, Edlesborough, Northall and Dagnall. Daytime and evening appointments are often available.